Next up this week is a book which had quite a profound effect on me. 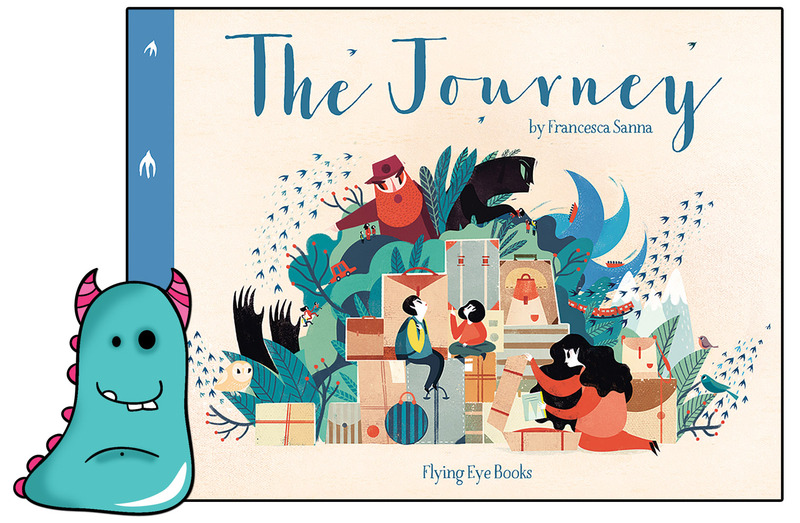 The Journey written and illustrated by Francesca Sanna and published by the ever wonderful Flying Eye Books. Francesca wrote this book having met two girls in a refugee centre in Italy, realising there was a powerful story to be told of their journey to the centre, she began exploring other people’s tales of immigration and The Journey is their combined story. It follows just one family, living happily in their home, until war breaks out, their father is taken and they are left alone and frightened. They must now head away with their mother. Away from everything they knew and loved into the unknown to hopefully, get to somewhere safe. The story is simply written, beautifully written. Yet the few words used manage to somehow explain everything that needs to be said. Francesca has expressed fear, alienation, exhaustion all through sparingly used prose and some of the most stunning illustrations you will see. Unlike the text, the illustrations are detailed. The desaturated colour palette is varied and interesting, yet within that, occasionally a black darkness spreads across the page, representing the form of war, the man who takes their money to cross the borders and everything the family fear. It is incredibly atmospheric. I genuinely found it quite heartbreaking to read. Particularly the page with the mother being strong for her children, yet tears washing her face once they are asleep. An understated yet incredibly powerful bit of imagery. I also loved the ending where the family’s story is paralleled with that of migrating birds. They both have a long and hard journey, but the family hope to one day have the freedom that the birds have in finding their new home. A lovely element of hope to end the book. This is certainly a story to be used within schools, the ideal method of addressing this tricky, pertinent and, of course, very current topic. It tells everyone’s story, can be applied to any similar situation and can be easily opened up to discussion with older children. I can see a huge amount of potential in classrooms, particularly with older children. Everything you need to know about the struggles of immigration is right here in this picture book. Perfectly executed with sensitivity and heart. I honestly can’t speak highly enough of this. Please take time to have a look at it. The Journey is released on April 1st, 2016, and will be available from all good book shops and libraries. A fab review of what looks like such a powerful and poignant book.